Origin of state name: The name is believed to have been given to the region by Spanish settlers from the Basque region of Spain. It means "fertile land, with rivers surrounded by mountains." Coat of Arms: The oak tree with two wolves represents Biscay, the home province of many of the Spanish settlers; the crown above the coat of arms represents the king of Spain. Holidays: Año Nuevo (New Year's Day—January 1); Día de la Constitución (Constitution Day—February 5); Benito Juárez's birthday (March 21); Primero de Mayo (Labor Day—May 1); Revolution Day, 1910 (November 20); and Navidad (Christmas—December 25). Flag: There is no official flag. Time: 6 AM = noon Greenwich Mean Time (GMT). Durango is located in northern Mexico. One of the largest states in Mexico, it covers an area of 121,776 square kilometers (47,018 square miles), about the same size as the US state of Mississippi. Durango is bordered by the Mexican state of Chihuahua on the north; by the Mexican states of Nayarit and Jalisco on the south; by the Mexican states of Zacatecas and Coahuila on the east; and by the Mexican state of Sinaloa on the west. Durango is divided into thirty-nine municipalities. The capital is also called Durango. The Sierra Madre Occidental and other smaller mountain ranges ( sierras ) cross the state from northwest to southeast. Deep canyons and a flat plain are located between the valley and semi-desert regions. Valleys, including the Guadiana valley, are separated by the Oso , Guajalote, Magdalena, Coneto, and Gamón mountains (sierras). The Florido River flows toward the Gulf of Mexico. Most of the state's rivers and streams run down from the mountains toward the Pacific Ocean. These include the Huyapan, Tamazula, Los Remedios, San Diego, and Mezquital rivers. 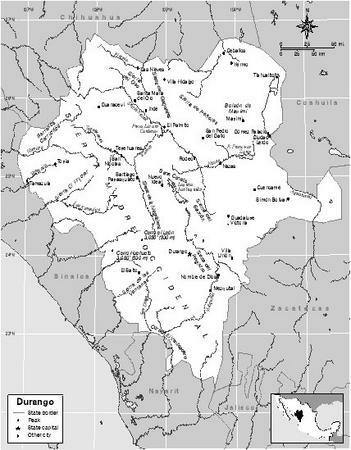 The Nazas and Aguanaval rivers flow into the Bolsón de Mapimí, a barren river basin. Average temperature is 21° c (70° f ). Average annual rainfall is 283 millimeters (11.2 inches). Monthly average rainfall in winter (November to April) is 8 millimeters (0.3 inch); monthly average rainfall in summer (May to October) is 36 millimeters (1.4 inches). 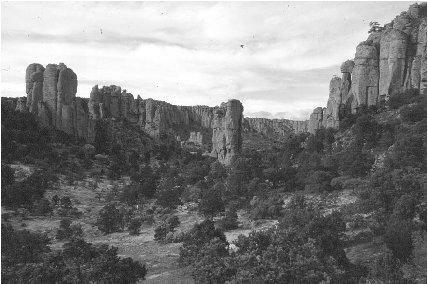 Durango has huge evergreen forests and also a large section of the Chihuahuan Desert where many varieties of cactus thrive. The desert turtle was once fairly common but is now endangered in the state of Durango. Guayule, a source of rubber, is native to the state. Common plants of the desert include the fragrant gobernadora , ocotillo (with thorny branches growing toward the sky), yucca (with tall flower spikes in the spring), and candelilla (with a wax-like coating on its leaves to preserve water). Nopal cacti and mesquite (a common desert shrub) are plentiful. Hundreds of species of butterflies are native to the state. Native animals include deer, badger, foxes, coyotes, squirrels, rabbits, kangaroo rats, and mice. pollutants they generate through manufacturing. There is a forest preserve, La Michilía Biosphere Reserve, on the eastern side of the Sierra Madre Occidental. Durango had a total population of 1,448,661 in 2000; of the total, 709,521 were men and 739,140 were women. The population density was 12 people per square kilometer (31 people per square mile). In 2000, the capital, Durango, had a population of 490,245. Almost all citizens in Durango speak Spanish, but about 2% of the population speaks one of the indigenous languages as their first language. According to the 2000 census, 79% of the population, or 1.1 million people, were Roman Catholic; 3%, or 48,794 people, were Protestant. That year there were also 19,515 Jehovah's Witnesses and nearly 50,000 people who reported no religion. Durango has 10,477 kilometers (6,548 miles) of roads providing links to the Pacific coast and to inland cities such as Monterrey, Nuevo Léon, and Saltillo, Coahuila . The two primary roads crossing the state are the Pan-American Road (running from México state to Ciudad Juárez, Chihuahua) and the Transoceanic Road (from the Mexican state of Tamaulipas through Matamoros, Coahuila, to Mazatlan, Sinaloa). There is an international airport serving the capital, Durango, with flights to about a dozen cities in Mexico and to Los Angeles and Chicago in the United States. There are also rails links connecting the state to border cities with the United States to the north and with many other cities in Mexico. Tepehuano indigenous groups inhabited Durango when the Spaniards first arrived in the 16th century. Captain Francisco de Ibarra was the first Spaniard to visit the region. The city of Durango was founded in 1563. Several indigenous revolts aimed at protesting the abuses and oppression by Spanish colonizers threw the region into turmoil for much of the 17th century. Franciscan and Jesuit priests (from different orders of the Roman Catholic Church) built missions and sought to convert and work with the indigenous people of the area. Tensions with indigenous groups, including Apache and Comanche warriors, lasted well into the 19th century. This made it difficult for colonizers to promote economic development and introduce new agricultural technology to the region. Yet, the tensions also reflected the poor living conditions that the native inhabitants of the region experienced during the colonial period and throughout most of the 19th century. Mexico witnessed the independence revolt led by Miguel Hidalgo (1753–1811) in 1810. Several local priests in Durango supported the revolt and attempted to rally the population. But local authorities, loyal to Spain, firmly opposed any uprising. Eventually, in the late 1810s, Pedro Celestino Negrete defeated the Spanish royalists in Durango and consolidated support for independence. Durango joined other states in signing the Plan of Iguala in 1821, which secured Mexico's independence. Durango was officially recognized as a Mexican state in 1825 and the first state constitution was written in 1825. Santiago Baca Ortíz became the first constitutional governor of Durango. The conflicts between liberal and conservative factions reached Durango in the mid-1850s. The conservatives managed to control the state during most of the period, but eventually liberal forces won control. The leaders in Durango united behind Porfirio Díaz (1830–1915). As president, Díaz in turn promoted economic and infrastructure development in the state. In 1909, wealthy and powerful citizens in Durango began to doubt that Díaz could continue to be effective as president. They supported Francisco Madero (1873–1913) in leading a revolution to oppose a new presidential term for the aging Díaz. Revolutionary leaders successfully gained control of Durango in 1911. It was not until 1917, however, that Domingo Arrieta successfully led the state to adopt a new constitution. Under his leadership, peace and order was restored to the state. Durango aligned with the winning faction of the Mexican Revolution (1910–1920) and signed the new 1917 constitution. But peace would not last long. Francisco "Pancho" Villa (1878–1923), the legendary revolutionary leader, attempted a new uprising in 1923 in the Tepehuanes region in Durango but was quickly defeated. Yet, four years later, Durango was involved in the Cristero War (1926–1929). This war was launched by Roman Catholic militants who opposed the restrictions placed on the Catholic Church by the federal government. The "cristero" resistance was eventually defeated, but post-revolutionary peace arrived in Durango a couple of decades after it reached the rest of Mexico. Following the passage of the North American Free Trade Agreement (NAFTA), a trade agreement between Mexico, the United States, and Canada, significant economic development took place in the state. The government invested significantly in new roads, upgrading of water systems, education and training, and improved health care systems. Durango has been dominated by the Institutional Revolutionary Party (PRI) since the end of the revolution. In the 1980s, 1990s, and early 2000s, other parties were gaining strength in Mexico, and elections in Durango were becoming more competitive. All of Durango governors have belonged to the Institutional Revolutionary Party (PRI) since the end of the revolution . Ángel Sergio Guerrero, elected governor for a six-year term (1998–2004), gave the PRI its most recent electoral victory. Durango has a unicameral (one chamber) state congress comprised of twenty-five deputies elected for nonrenewable three-year terms. Fifteen deputies are elected in single-member districts and ten by proportional representation. Although formal separation of powers and check-and-balance provisions exist in the constitution, the overwhelming power exercised by the PRI and the strong formal and informal attributions of the governor have limited the power and influence of the state legislature. Comprised of thirty-eight municipalities, local governments in Durango are relatively weak and their attributions are mostly limited. Elections take place every three years for municipal presidents and council members. Immediate re-election is not allowed. The three main political parties in all of Mexico are the Institutional Revolutionary Party (PRI), the National Action Party (PAN), and Party of the Democratic Revolution (PRD). Durango's politics have been dominated by the influential and powerful PRI. In the 1990s, Durango witnessed the emergence and consolidation of the PAN and PRD. Yet, as of 2004, those two parties had failed to transform their growing appeal into a statewide electoral victory. The Superior Tribunal of Justice is Durango's highest court. Its eight members are elected for six-year, nonrenewable terms by the governor with legislative approval. Appointees must meet a number of stringent qualification requirements. In addition, an electoral tribunal and a number of local courts and tribunals comprise the judiciary system in Durango. Because of the dominance of one political party (PRI), the judiciary may not operate with total independence. 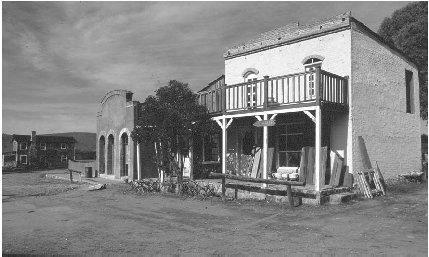 The economy of Durango was once limited to agriculture and mining. Since the passage of the North American Free Trade Agreement (NAFTA) in 1992, hundreds of maquiladoras (assembly plants) have developed. Among the companies that operate in Durango are Sam's Club, Honda, and Wal-Mart. Mining of silver and gold continue to be important economic activities as well. Most industrial activity is centered around the capital, Durango, or in the east in a region known as La Laguna, around the cities of Gomez Palacio and Lerdo. As of 2004, there were nearly 4,000 industrial enterprises employing more than 100,000 workers. The main industries represented in Durango are clothing, wood products, auto parts, mining, food processing, and electronics. Durango collects a 2% payroll tax from all wage earners. The US Bureau of Labor Statistics reported that Mexican workers saw their wages increase 17%, from $2.09 per hour in 1999 to $2.46 per hour in 2000. (The average U.S. worker earned $19.86 per hour in 2000.) After one year, workers are entitled by law to six days paid vacation. Durango ranks second among the Mexican states in production of goat's milk. It ranks fourth in production of poultry and sixth in production of cow's milk. In rural areas, many families carry out small-scale agriculture on small plots, growing food for their own consumption or to sell locally. In the early 2000s, family farmers were concerned about the impact of genetically engineered maize (corn) on their crops. 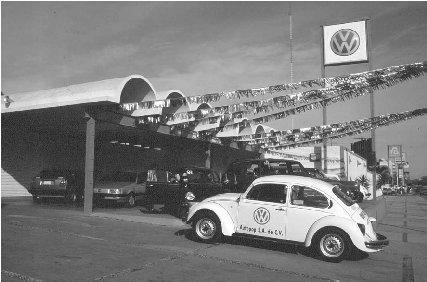 This Volkswagen dealership is in the city of Gomez Palacio. Most industrial activity is centered around three cities: the capital, Durango, Gomez Palacio, and Lerdo. mojarra. Durango, San Dimas, and Otáez are known for their gold and silver mining activities, while lead is produced at Cuencamé and Guanaceví . Zinc, copper, and fluorite are also produced in various parts of the state. Mexico is the largest silver producer in the world; Durango is the third largest producer of silver (after the Mexican states of Zacatecas and Chihuahua). Lead, zinc, and copper are also mined in Durango. The Guadiana valley is known for fish farms. Durango also is a leading producer of pine and oak lumber. Demand for electricity grew rapidly (from 1,321 gigawatt-hours in 1993 to nearly 2,000 gigawatt hours by 2000) after the North American Free Trade Agreement (NAFTA) went into effect in 1992. There is potential for development of hydroelectric power along the western slopes of the mountains. Durango has 18 general hospitals, 479 outpatient centers, and 38 surgical centers. Most of the Mexican population is covered under a government health plan. Durango movie set where many Hollywood Westerns were filmed. The IMSS (Instituto Mexicano de Seguro Social) covers the general population. The ISSSTE (Instituto de Seguridad y Servicios Sociales de Trabajadores del Estado) covers state workers. The quality and quantity of available housing has not kept up with the rapid development of industry in the state since 1992. About half of all housing needs upgrading, with 20% requiring significant upgrading (including the installation of running water). The system of public education was first started by President Benito Juárez (1806–1872) in 1867. Public education in Mexico is free for students from ages six to sixteen. There were about 350,000 school-age students in the state in 2000. Many students elect to go to private schools. Durango has many theaters and galleries selling local handicrafts. In the capital, Durango, there is an art school where students may study painting and sculpture. The Durango Performing Arts area is on the north side of the capital. There, footprints of many famous Hollywood movie stars who came to Mexico to film have been preserved. There are 111 branches of the national library in Durango. There are thirty-six museums, including a museum of cinematography, a children's museum, a museum of contemporary art, a museum of the Mexican Revolution, and an archeology museum. The capital city of Durango has two daily newspapers, El Siglo de Durango and El Sol de Durango. The capital, Durango, has been the set for many cowboy movies. Some movie sets, Puebla del Oeste, Chupaderos, and Rancho La Joya, are still in operation. Guadiana Park has an artificial lake. Durango has a basketball team, Leñadores, and a soccer team, the Alacranes. Soccer matches are played in the 18,000-seat Francisco Zarco stadium. Famous citizens born in Durango include composer Silvestre Revueltas (1899–1940), who drew on Mexican folk music themes in his works for orchestra. Francisco "Pancho" Villa (1878–1923), though not born in the state, was known as a revolutionary bandit in Chihuahua and Durango. Carew-Miller, Anna. Famous People of Mexico. Philadelphia: Mason Crest Publishers, 2003. DeAngelis, Gina. Mexico. Mankato, MN: Blue Earth Books, 2003. Supples, Kevin. Mexico. Washington, DC: National Geographic Society, 2002. Mexico for Kids. http://www.elbalero.gob.mx/index_kids.html (accessed on June 15, 2004). Please give me the name of a popular newspaper where I can place an ad. I'm looking for some people. NICE facts i am really happy i found this site so i can do my mexico project, thanks.